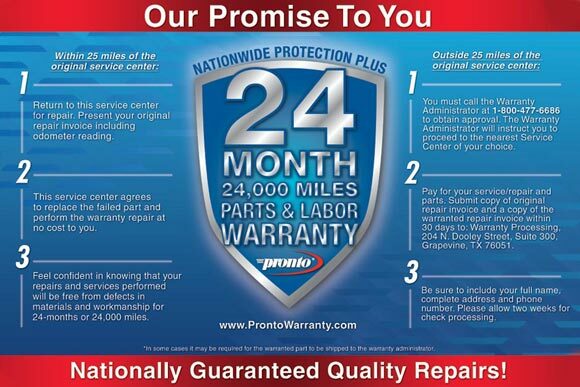 This warranty is made by the Independent Service Center and is administered by National Pronto Association. This warranty applies only to the vehicle owner at time of the original repair and is not transferable. This is a reimbursement warranty for consumers which covers the originally installed part (see “Not Covered” for a list of exclusions) and labor associated with said part up to the original dollar amount listed on the original invoice (see “reimbursement limits”). The original part must have been installed by a participating Pronto Smart Choice Advantage Service Center and the Service Center must have been current on the program at the time of installation. Additionally, the warranty repair on the failed part must be performed by a Service Center and not an individual for the part to qualify for coverage. The warranty is offered for 24-months or 24,000 miles; whichever comes first. An Odometer reading is required to be listed on the original ticket and the rework ticket. Odometer reading and date of service will be used to determine eligibility. If an odometer reading and/or service date is not listed, this warranty is void. Consumer must keep a copy of the original invoice for the warranty to be valid. The Service Center is required to stamp or print the Protection Plus logo on the invoice. The 25-mile rule also governs this warranty. The Independent Service Center warrants the repairs and services performed will be free from defects in materials and workmanship for 24-months or 24,000 miles of use; whichever comes first. Service Centers agree to honor the warranty for any vehicles returning to their shop for service under the 25 mile rule. Service Centers also agree to honor the manufacturer’s written warranty (labor excluded) on parts replacement outside the Protection Plus warranty period of 24-months or 24,000 miles (whichever comes first) and the manufacturer’s written warranty will govern the product replacement. Independent Service Centers may stock different brands of merchandise by location. Each participating outlet has the right to replace a covered part with a like part of equal value. The Service Center is responsible for passing on the warranty information to the consumer. • If the consumer is more than 25 miles from the original service center, the consumer must call the Warranty administrator to start a warranty claim prior to any work being performed. The warranty administrator will give instruction on how to handle the warranty. • If a consumer is 25 miles or less from the original service center, consumer must return to the original service center for warranty work. Service center agrees to replace the failed part without charging the consumer for parts or labor. • In both cases, please refer to the section on “How to Obtain Warranty Service”. Failure to follow the 25 mile rule instructions will automatically void the Protection Plus warranty. • All Parts** installed by a participating Pronto Smart Choice Advantage Service Center. **Please refer to “Not Covered Under this Limited Protection Plus Warranty” for a list of parts and services not covered. • Rental Car Reimbursement: Rental car coverage is included as part of a warranty repair which takes place in or out of market for 24-months or 24,000 miles; whichever occurs first. Rental car coverage under this program is covered at a maximum of two days and at a maximum of $50 per day. Total rental car coverage including any fees and taxes may not exceed $100 for a two day period. To qualify for rental car coverage, the claim must meet the following criteria; (1) Parts listed on original repair invoice must match the re-work invoice and (2) must provide a legible rental car receipt with dates which match the re-repair invoice. • Towing Reimbursement: Towing coverage is included as part of a warranty repair for 24-months or 24,000 miles; whichever occurs first. Towing coverage under this program is reimbursable up to $90. To qualify for reimbursement (1) Parts listed on original repair invoice must match the re-work invoice (2) must provide a legible copy of tow receipt and (3) towing must be performed by a licensed Roadside provider or Service Center. Reimbursement is limited to covering only the failed part (as listed on original service ticket), labor, and tax associated with part for a period of 24-months or 24,000 miles; whichever comes first. The date of original repair and odometer reading will be used to determine eligibility. Reimbursement is limited to covering up to the original dollar amount charged for the part and labor/tax associated with part as listed on the original service ticket. Reimbursement shall not exceed original cost of installation. If the warranty repair costs are less than the original service ticket, the lesser amount will be reimbursed. Incidental or Consequential damages are not covered. Consumer must complete the following steps prior to any work being performed. All claims are subject to verification before any reimbursement may be made. If consumer is 25 miles or less from the original service center, consumer must return to the original service center for warranty work. The original service center agrees to replace the failed part and perform the warranty repair at no cost to the consumer. Consumer must pay for any non-warranty services ordered. • If consumer is more than 25 miles from the original service center, consumer must call the Protection Plus Warranty Administrator at 1-800-477-6686 for warranty instruction and approval. Warranty line is answered Monday thru Friday, 7:00 am - 5:00pm Central time. For after hours emergencies, an automated voice mail system will give instructions and an alternate phone number for help if needed. During normal business hours, Warranty Administrator will provide instruction on what steps to take in regards to your warranty. Warranty administrator may offer a referral to another participating service center. However, under this Protection Plus limited warranty, the consumer has the right to choose where they take their vehicle for service. Limits of reimbursement apply – see “Reimbursement limits”. • This is a limited reimbursable warranty and consumer MUST pay for the part(s), labor, and tax on the warranty repair at the time of service. Consumer must also pay for any non-warranty services ordered. Non-warranty service is not reimbursable. Reimbursement limit applies. Reimbursement is limited to covering the failed part (as listed on the original ticket), labor, and tax associated with failed part. Incidental or Consequential damages are not covered under this warranty. Reimbursement shall not exceed cost of original repair. • For reimbursement: Submit a legible copy of the original receipt and a legible copy of the warranty repair receipt (must show paid in full) within 30 days to: Warranty Processing, 204 N. Dooley Street, Suite 300, Grapevine, TX 76051. Include the following with your warranty claim: full name, mailing address, and contact phone number. Please contact the warranty administrator prior to mailing claim paperwork. • In some cases it may be necessary for the consumer to ship the failed part to the Warranty administrator. The Warranty administrator will provide instruction on how to ship the part and will reimburse consumer for any shipping charges incurred (a shipping receipt must be submitted to warranty administrator). Failure to ship a requested warranted part voids this warranty. • Please allow two weeks for check processing. This limited warranty does not cover fleet or commercial vehicles (see definition of fleet and commercial vehicles). This warranty does not cover Recreational vehicles or Performance vehicles. This warranty is not transferable; either from consumer to consumer or dealer to consumer. This warranty will not apply if the vehicle has been damaged by abnormal use, neglect, misuse, or accident. This warranty does not cover any other warranty offered by the service center. Engines, rebuilt engines, or engine assembly. Transmission, Transaxles, Transfer cases for automatic and manual transmission. Differential Assembly: any repair or component replacement including, but may not be limited to: ring gear, pinion shaft and related gears, associated bearings, and pinion seals. Fleet Vehicles: Fleet vehicles are groups of motor vehicles owned or leased by a business or government agency, rather than by an individual or family. Commercial Vehicles: A commercial vehicle is a type of motor vehicle which may be used for transporting goods, passengers, or used for business. National Pronto Association reserves the right to modify the terms of the labor reimbursement portion of this warranty. The facilities employees and/ or agents do not have authority to modify the terms of this warranty. The terms of the parts warranty is governed by the manufacturer of the components. This warranty does not include incidental or consequential damages, or other additional expenses which may be incurred as a result of a premature parts or labor failure. Some states do not allow the exclusion of incidental or consequential damages and therefore this limitation may not apply, as rights vary from state to state.